HELLO! 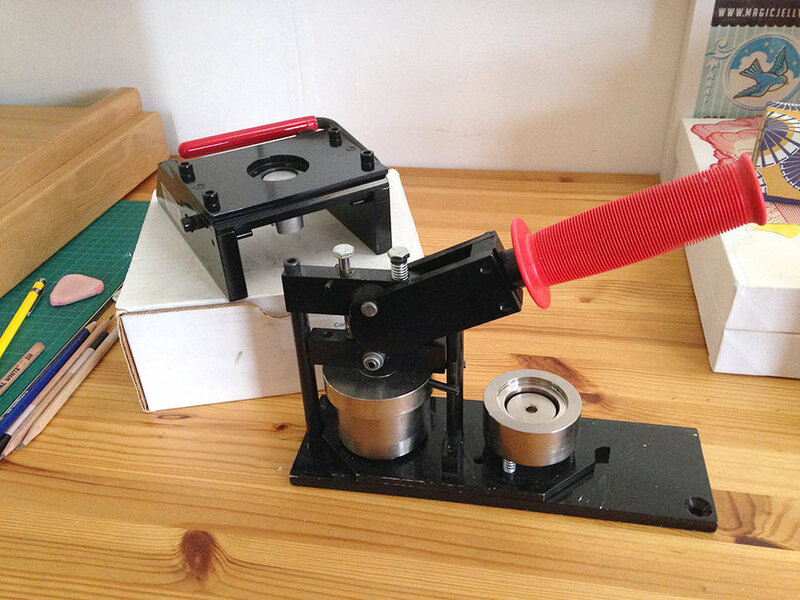 THESE ARE TECRE BRAND PROFESSIONAL BUTTON PRESSES AND PAPER PUNCHES, PLUS COMPONENTS SPECIFICALLY MADE TO USE WITH THESE PARTICULAR MODELS TO MAKE BUTTON BADGES, MAGNETS, KEYRINGS, POCKET MIRRORS, DRINK COASTERS AND MORE. THE MACHINES ARE IN VERY GOOD CONDITION, SHOWING INEVITABLE WEAR TO THE PAINT WHERE MOVING PARTS ARE, BUT ALL IN PERFECT WORKING ORDER. TO GIVE YOU AN IDEA OF THE RETURN YOU MIGHT EXPECT, I'VE SOLD MY BUTTONS, ETC. BOTH RETAIL AND WHOLESALE, HERE IN AUSTRALIA AND TO OVERSEAS RETAILERS, AS WELL AS AT LOCAL MARKETS. THE PRODUCTS I'VE MADE, FEATURING MY ARTWORK HAVE RETAILED AS FOLLOWS: $12.50 MAGNET FOUR PACK, $12.00 POCKET MIRROR, $8.50 BUTTON BADGE FOUR PACK, $8.00 DRINK COASTER, $3.50 MAGNET, $2.50 BUTTON BADGE (ALL AUD), PACKAGED ON DECORATIVE BACKING CARDS IN CELLO SLEEVES. I'M SELLING EVERYTHING DESCRIBED BELOW AS A SINGLE LOT, PICK-UP FROM SEMAPHORE, SOUTH AUSTRALIA. $2000 AU NON-NEGOTIABLE. Below left: Tecre 1.25" graphic punch that cuts paper and light card to fit the press. Below right: Tecre 1.25" button press. The parts available for this model can make pin-back button badges (supplied), button magnets (supplied), keyrings (supplied), and you can buy parts to make different keyring styles, ponytail holders, zipper pulls and flat-backed parts that enable you to make hair clips, rings and other accessories. Below rear: Tecre 3.5" graphic punch that cuts paper and cover weight card to fit the press. Below front: Tecre 3.5" button press. The 3.5" press comes in a paper model and a photo model - the photo model allows you to make mirrors and coasters from thicker papers (such as photo paper) as well as lighter weight papers. The paper model only handles lighter weight papers. This is the photo model. Along with mirrors and drink coasters (parts supplied) you can buy parts to make ribbon-backed Christmas ornaments, button badges and magnets. Below, clockwise from top: Self-adhesive cork backings for coasters. There are parts to make 180 coasters. Self-adhesive ceramic magnets. There's one full bag of 250 and one bag approx. half full. A bag of keyring parts and the loops for the back (amount as you see here but I haven't counted them). The metal disc is a magnetic die that fits into the press to make drink coasters. It flattens the shell (which is slightly convex) so a glass or mug will sit flat on top of it. You can't make coasters without it! Packets of mylar covers in both sizes (there are more). Below: 3.5" parts to make 75 pocket mirrors. Shells, collets, shims, glass mirrors and mylar. I think I have some spare mirrors too. I forgot to take a photo of the coaster backs, but there are enough to make 180 coasters. Below: 3.5" shells for mirrors and drink coasters (not sure how many, but more than enough for the supply of mirror and coaster parts). Below: 1'25" pin-backs for buttons. I haven't counted them, but there are lots. Below: 1.25" shells for button badges, magnets and keyrings (haven't counted them but there are lots) as well as metal backs for magnets.